No artist is credited for this charming Art Deco illustration of a little blonde girl sitting next to her white puppy on a couch. Verso, we are simply told this is the "artitisque" series produced by the London Inter-Art Company. What a shame that the artist is not given his or her due for it's a bold and colorful design that makes one say "I want all three: the girl, the puppy and the couch." The girl is wrapped up in a pouffy red hat, a hint of blonde curls sticking out underneath, and a black coat generously trimmed in fur. She is surrounded by stripes: white and green stripes in the huge fluffy pillows on either side of her as well as the green and black stripes of the couch. The red in the girl's floppy beret is repeated in the ribbon around the white puppy's neck and the floral design scattered among the stripes of the couch. Note, too, the oblong black pillow dangling off the edge of the couch. It all comes together for a very colorful geometric design, tres Art Deco. 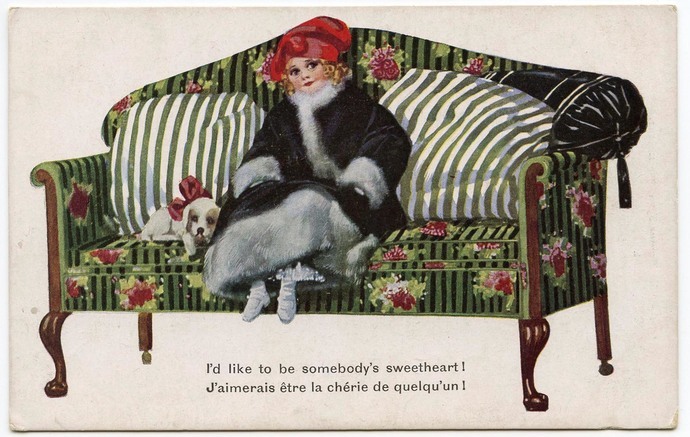 At the bottom we have the postcard caption in French and in English: I'd like to be somebody's sweetheart! 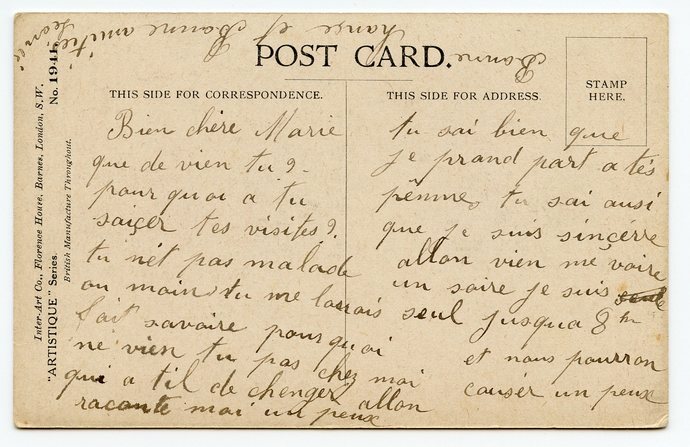 Verso, Leonie had a lot to say to her friend Marie. Apparently, the card was sent in an envelope for there are no postal markings or stamp/address. Based on the Art Deco design, I'd date this card to after WWI, into the early 1920s. It shows signs of age and wear as to be expected for a piece of cardstock almost 100 years, but all small, minor things -- nothing so garish as to take away from its charm.